Fleet Enemas are sodium phosphate enemas that can be used to prevent or treat initial or minor meconium impaction in newborn foals. 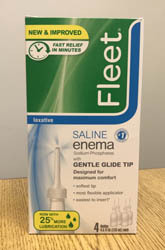 The enemas come ready to use in single-use squeeze bottles with pre-lubricated tips. 4 enemas per pack.